Boss information for Chrono Trigger. name: the boss' name. This also determines the ID for linking purposes. 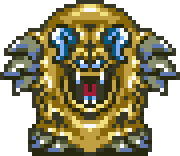 dsname (optional): the boss' name in the Nintendo DS version, if different than the original name. This adds an ID for the DS name, as well as combined IDs in the format of boss (ds boss name). image: An optional image of the boss, in the format of "Imagename.extension". imagewidth: an optional width of the image (specify in syntax like "#px" without quotes). Image defaults to its full size. side: Align the image to either "left", "center", or "right" (use those words). Defaults to left. level: Optional recommended party level range. strength: Things that it is strong or invincible against. absorb: Things that heal instead of damage it. text: Some description/strategy for the boss. Some description of the boss. This page was last edited on 22 August 2014, at 19:43.